It's a miracle! I *finally* managed to stamp and finish a card! I've been trying since Friday, schwooo! That was scary! lol! I actually started this card a few weeks ago...well, I had the Groovy Gauva large scallop circle (thanks to Coluzzle and the Slit Punch), the small felt flower, and the Blue Bayou square card...I just finally managed to do something with them. What first started this card was the small felt flower. Yes, it's a SU pumpkin felt flower and I decided to see what would happen if I heat embossed it with white powder. And that's what happened! I smushed the entire flower in the Versamark pad, covered it with Winter White embossing powder and heated it up. It covered pretty well, but I repeated the whole process one more time to be safe. I've been experimenting some more with these flowers and will share in a few days. I was really wanting to sew around the edge of this card and the edge of the scallop flower, but I was just too lazy! So I compromised and used the zigzag stamp from All in a Row to at least get the effect around the edge of the card. The brown twill ribbon and the little white label are from Martha Stewart. Let me know if you have any other questions. Thank you all for your super sweet comments the last few days! Everything is sinking in and I'm feeling better. I went with DH to see Iron Man today. He's been waiting patiently for me for weeks now...stuff kept coming up and I kept putting him off. We actually had a bet between Iron Man and The Incredible Hulk (he doesn't understand the need for another Hulk movie, which I agree with, but it has Edward Norton, Jr., come on!!). I'm afraid he's going to win, because Iron Man was awesome! I've also read several comments asking for instructions on how to make those little mini albums that I made for my students and how to put them together, so check back tomorrow for that! Thanks for stopping by! Have you stamped today? 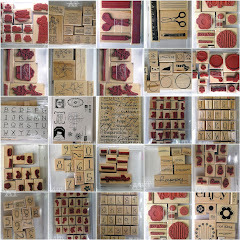 Recipe Stamps: Hi and Hello, All in a Row. Cardstock: Blue Bayou, Groovy Guava, Afternoon Tea DSP. Ink: Chocolate Chip, Versamark. Accessories: Jumbo Eyelet, Crop-a-Dile, 1/8" Circle Punch, Slit Punch, Coluzzle, Dimensionals, Pop Up Glue Dot, Felt Flower, Winter White Embossing Powder, Heat Gun, Martha Stewart Brown Twill Ribbon & White Label. Look at those great patterns on your card! This is so cool! I love it! how fun! Let me know how you like Incredible Hulk - DH doesn't want to see it but I do because I love that actor too! I really loved Iron Man! 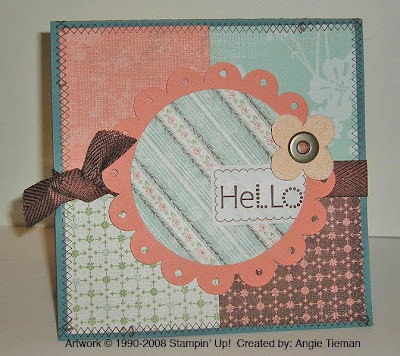 Super fun card...love the scallop circle and of course the brown twill! LOL...your hubby will win ya know!! Let us know if you enjoyed the Incredible Hulk...LOL Love the card and the placement of the Hello and flower! Big Pieces & Little Pieces...another goodbye! Vintage finds aka little treasures! FS71 "Wanted" & Retirement Special! Even More Dry Embossing and Last Day of School!